HomeCompany NewsBoomstarter is now Officially listed in Bluebelt Exchange! 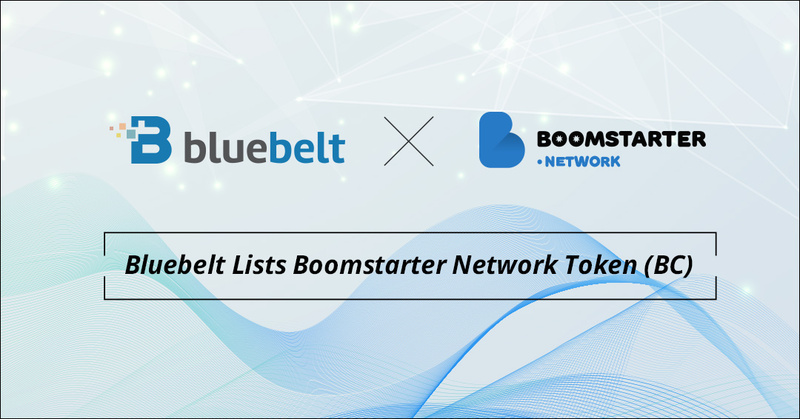 We are more than happy to announce the listing of Boomstarter Network on our Bluebelt Exchange this 19th of March 2019. As part of the listing celebration, we are thrilled to announce that BC Bounty Hunters can claim their BC tokens by opening an account with Bluebelt. The listing of Boomstarter token in Bluebelt Exchange will improve the processing of transaction by making it more convenient and quicker. Reminder: The email address registered to the BC Bounty should be the same email address to be used in opening account with Bluebelt. 1. Go to https://www.bluebelt.asia/ and open an account. 2. Wait for your account to be verified. 3. We will send the total amount of tokens due to you. Note: The Bounty Distribution will run from March 19, 2019 until May 19, 2019. Stay tuned for more updates regarding the upcoming bounty program brought to you by Bluebelt and Boomstarter.